27 December 2013 - Metal2Mesh has decided to make their upcoming Mirage 2000C available for early purchase during an Open Beta phase. Participating in the beta assures you of updates during development as well as the final release. For more information visit their website. 24 December 2013 - May you and your loved ones enjoy the true meaning of Christmas and have a prosperous New Year. 20 December 2013 - John Stinstrom has released a new FS2004 scenery for BAN Landivisiau (LFRJ). Designed for use with the MAIW French Rafales package but will work for any aircraft. 17 December 2013 - Alex Guerreiro has gathered the Mirage F1 by Kirk Olssen with the FSX compatible VC by Danny Garnier and several uncredited repaints -- 34 combinations -- into a Mirage F1 Megapack compilation. 14 December 2013 - I put up the annual Holiday Season's Greeting on the Home page. I used an image of the static display Mirage IIIRS "Black AMIR" sent to me by Beat "Isra" Shaefner. 10 December 2013 - I have painted a set of textures for the Restauravia Mirage IIIB. The texture set represents a Mirage IIIBJ of Israel Defense Force/Air Force 119th "Bat" Squadron stationed at Tel Nof Air Base. I have also updated the textures I painted earlier for Israel Air Force 101 Squadron. 29 November 2013 - Stéph24 has repainted the Rafale C/M of Roland Laborie. The texture set represents a Rafale M in the colors of Flotille 11F in "90th Anniversary" markings. 25 November 2013 - Stéph24 has repainted the Rafale C/M of Roland Laborie. The texture set represents a Rafale C in the colors of ECE 5/330 'Côte d'Argent'. 21 November 2013 - A part of the cancelled Super Etendard AI project from Nick Black and MAIW was to be an update to the Armée de l'Air KC-135FR Tanker. Mike MacIntyre has released the model and visitors of the MAIW forum have created flight plans and some parking AFCAD files for Istres/Le Tubé AB (LFMI). 6 November 2013 - Nick Black was unable to complete his Super Etendard AI project but Mike MacIntyre of MAIW has packaged the aircraft with textures for Flotille 11F and 17F. Models with nine different external configurations are included along with the land based flight dynamics file. 13 October 2013 - Bertrand Barbé has completed two textures sets for the Rafale C/M by Roland Laborie. First is textures for a Rafale C of the upcoming EC 3/2 'Alsace' at Mont de Marsan. The second set represents the most recent Rafale C (serial 144) delivered to Spa 162 of EC 1/7 'Provence'. 6 October 2013 - Geoffrey de Kergariou has repainted the Mirage IIIB from Restauravia as a Mirage IIIB in the colors of EB 2/91 'Bretagne' at Cazaux AB in 1990. 3 October 2013 - I have painted a set of textures for the Restauravia Mirage IIIB. The texture set represents a Mirage IIIBJ of Israel Defense Force/Air Force 101st "First Fighter" Squadron stationed at Hazor Air Base. Only the textures are included so you will also need the base package. 29 September 2013 - Bertrand Barbé has painted a new set of textures for the Rafale C by Roland Laborie in the markings of EC 1/7 'Provence' at BA 113 St. Dizier. He has included an example for SPA 15, 91, 162 and the ET 02.092 'Aquitaine' training squadron (below). 24 September 2013 - Restauravia has issued a v1.2 update to their Mirage IIIB. The update is to correct some display issues reported by some users of v1.1. This update should allow Restauravia to put all of their attention towards their next project -- the Mirage IIIC. The v1.2 update is available from their website exclusively. In memory of those lost on September 11, 2001. 8 September 2013 - Fabien Raoul has painted two new schemes for the Mirage 2000-5 of Roland Laborie. The first is of a Mirage 2000C in the markings of EC 2/5 'Ile de France'. The second repaint is of a Mirage 2000-5 in the markings of EC 3/30 'Lorraine' stationed at Al-Dhafra Air Base in the United Arab Emirates. 4 September 2013 - Restauravia has issued a v1.1 update to their Mirage IIIB. The update is to improve the multiplayer functionality but also includes improvements to other systems including the GCA. The update is available from their website exclusively. 31 August 2013 - Fabien Raoul has repainted the Mirage IIIB from Restauravia as a Mirage IIIB in the colors of EB 01/93 'Bretagne' at Cazaux AB in 1966. 26 August 2013 - Daniel Reeves had compiled a new AI Traffic file set for the Mirage III/5 AI aircraft of Michael Pearson. This file set represents the Mirage III and Mirage 5 of the Pakistani Air Force. 20 August 2013 - I have discovered another set of textures for the Mark Harper/Skysim Mirage III/5 package. The texture set by Kurt Stoeckli represents three Mirage III test aircraft of the Swiss Air Force. 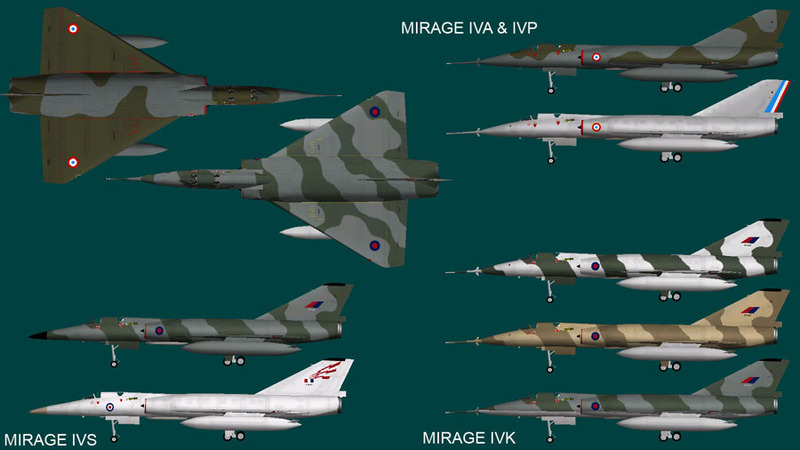 10 August 2013 - Richard Luycx has painted a set of textures for the Mirage IIIB from Restauravia. The texture set represents a Mirage IIIB of EC 2/2 'Cote d'or' with dayglo markings. 6 August 2013 - Daniel Reeves had compiled a new AI Traffic file set for the Mirage III/5 AI aircraft of Michael Pearson. This file set represents the Mirage 5BA, Mirage 5BR and Mirage 5BD of the Belgian Air Force. 1 August 2013 - Shaun Mulder has painted a set of textures for the Mirage IIIB from Restauravia. The texture set represents a Mirage IIIBZ in the "Flag" scheme of the SAAF Museum. Only the textures are included. 29 July 2013 - Stéph24 has repainted the Rafale C/M of Roland Laborie. The texture set represents a Rafale C in the colors of EC 2/30 'Normandie Niemen' in the 70th Anniversary scheme. 26 July 2013 - Aaron Haase has painted another set of textures for the AI Mirage 2000C of Fernando Martinez. The textures represent an aircraft in special 60-Year Anniversary scheme for EC 1/12 'Cambrésis'. Only the textures are included so you will also need the base Mirage 2000C aircraft. 21 July 2013 - Fabien Raoul has repainted the Rafale C/M of Roland Laborie. The texture set represents a Rafale C in the markings of EC 1/7 'Provence', SPA 162 "Tigre". 19 July 2013 - Bertrand Barbé has painted a set of textures for the FSX Mirage 2000-5 of Roland Laborie. The texture set represents a Mirage 2000-5 of the CEAM at Mont-de-Marsan. 17 July 2013 - Hank Essers has painted two sets of textures for the Mirage IIIB from Restauravia. Both are of Israel Air Force Mirage IIIBJ in bare metal finish representing 117 and 119 Squadrons. 13 July 2013 - Martin Gossmann has updated the textures in several Mirage 2000 AI packages to be FSX compatible. 11 July 2013 - Bertrand Barbé has painted two sets of textures for the FSX Mirage III/5 of Mark Harper. The first is a Mirage IIIR of ER 1/33 'Belfort'. The second is a Mirage IIIRD of ER 4/33 'Beaujolais', a short term unit for the remaining IIIRD while ER 33 converted to the Mirage F1CR. 9 July 2013 - Fabien Raoul has repainted the Mirage 2000-5 of Roland Laborie. The texture set represents 12 aircraft from EC 1/5 'Vendée', EC 2/5 'Ile de France', EC 3/5 'Comtat Venaissin', EC 1/12 'Cambrésis', and EC 2/12 'Picardie'. 6 July 2013 - "Darmon" has repainted the Mirage IIIB from Restauravia in the markings of EC 2/2 'Côte d'Or' with a fictitious Air Defence blue scheme. 29 June 2013 - I have painted a few sets of textures for the Mirage IIIB by Restauravia. 25 June 2013 - After a couple years away Nick Black has returned to the world of Flightsimming and is working on a new project -- an AI version of the Super Étendard Modernisé. 22 June 2013 - Fabien Raoul has repainted the Rafale C/M of Roland Laborie. The texture set represents a Rafale C in the colors of EC 1/7 'Provence' in the "Last Flight 1/12 Cambrésis" scheme. 19 June 2013 - Bertrand Barbé has painted three sets of textures for the FSX Rafale C/M of Roland Laborie. First is a Rafale C of EC 3/30 'Lorraine' based at Al Dhafra Air Base, United Arab Emirates. Second is the Rafale C of EC 2/30 'Normandie Niemem' at Mont-de-Marsan BA. Two textures are included for the high-vis and low-viz markings. The third set of textures is for three Rafale M of the Aéronavale Française in the markings of Flotille de Chasse 11F at BAN Landivisiau. He has also painted (with permission) textures for the FSX Mirage 2000-5 of Roland Laborie. This very large file includes textures for the entire squadron (25 aircraft) of EC 1/2 'Cigognes' now based at Luxeuil-St Sauveur AB. Bertrand has also painted four aircaft of EC 3/11 'Corse' based at Djibouti. 14 June 2013 - Bertrand Barbé has painted three sets of textures for the Mirage III/5 of Mark Harper in the colors of EC 3/3 'Ardennes'. Included is a Mirage IIIE from the 1990's and two Mirage 5F (original bare metal and camouflage) from the 1970's. 10 June 2013 - Bertrand Barbé has repainted the Mirage IIIB from Restauravia as a Mirage IIIB in the colors of EC 1/2 'Cigognes' at Dijon-Longvic AB in 1963. 6 June 2013 - The Royal French Navy have created several FSX Acceleration mission files for use with the Foch and the Charles de Gaulle carriers. 3 June 2013 - 'Steph_24' has repainted the Mirage IIIB from Restauravia as the "Last Flight" Mirage IIIB2(RV) of EB 02/091. 31 May 2013 - Zsolt Beleznay has released five texture sets for the Mirage III. Three are for the new Restauravia Mirage IIIB. These include two in SAAF markings -- bare metal and camouflage -- and one in fictitious RAAF ARDU markings. 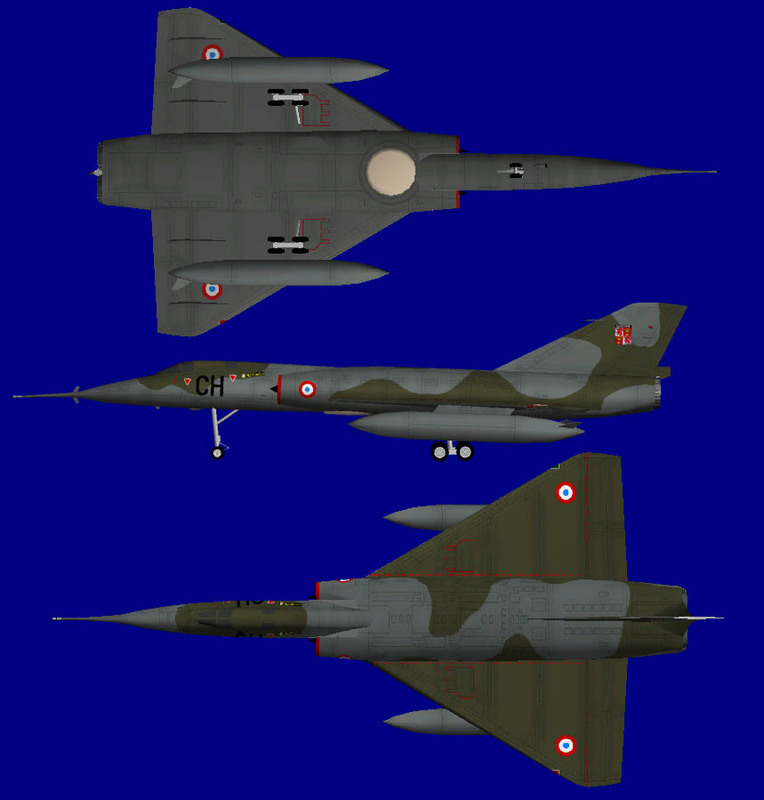 The remaining two texture sets are for the Mirage III by Mark Harper. They include a Mirage IIIO in RAAF ARDU markings and a Mirage IIIC of EC 2/10 'Seine'. 29 May 2013 - There have been several new texture sets for the Restauravia Mirage 3B. Bertrand Barbe has painted two texture sets representing a Mirage IIIB of the Swiss Air Force. Dave Quincey has painted a set of textures representing an RAAF aircraft from No. 2 OCU in a unique green/brown camouflage scheme. Jan Kees Blom has also painted a set of textures representing an aircraft from No. 2 OCU, this one in the traditional green/gray camouflage scheme. 27 May 2013: Corentin Digneaux painted a set of textures for the Mirage 3B by Restauravia. The textures represent a Mirage IIIB of E.R. 2/33 'Savoie' at Strasbourg-Entzheim in 1964. And Fabien Raoul painted another set of textures for the Mirage IIIB. The texture set represents a Mirage IIIB in the colors of the Ecole du Personnel Navigant d'Essais et de Reception (EPNER) in the 50 Years Anniversary scheme. 25 May 2013 - Michael Pearson has released his AI Mirage IV for FS9. He has divided the aircraft into two packages. The first package for "purists" includes the Mirage IVA/P and and Mirage IIIB2 trainer in the markings of the French Air Force. The second is a "what if" package and includes IVK/S variants and schemes for the Royal Air Force, France, Israel, and India. 23 May 2013 - Zsolt Beleznay has painted two more texture sets for the Mirage III/5 by Mark Harper. The first represents a Mirage IIIEBR of the Força Aérea Brasileira. The second is a Mirage IIIO of the Royal Australian Air Force. 19 May 2013 - I have painted up two Mirage IIIB texture sets representing the Centre d'Instruction des Forces Aeriennes Strategiques (CIFAS) and Centre d'Experiences Aeriennes Militaires (CEAM). Only the textures are included so you will also need the base package from Restauravia. 18 May 2013 - Almost immediately the modders get busy. There is an interesting thread at Sim-Outhouse regarding afterburner flame for the Restauravia Mirage IIIB. Is it visible at all from an Atar 9B engine (?) and how to add it. 16 May 2013 - Restauravia have released their new Mirage IIIB for FSX/Acceleration. The package features five schemes and two versions -- full-featured and "lite" for multi-player. Several external tank options are available. Please see the preview page for more information. The aircraft will be an exclusive download from the Restauravia website. 13 May 2013 - I have put together a preview page for the upcoming Mirage IIIB from Restauravia. 10 May 2013 - In addition to his work on the Mirage III/5 for use as AI traffic Michael Pearson has also been working on a Mirage IV for use as AI traffic. Here is an image with a few "what if" schemes he intends to include in addition to Armée de l'Air schemes. 5 May 2013 - Michael Pearson continues to add to his list of Mirage III/5/50 AI subjects. He recently released the Royal Australian Air Force Mirage IIIO and Mirage IIID. 23 April 2013 - Sylvain Parouty/RFN has released his new Charles de Gaulle (R-91) carrier for FSX/Acceleration. Static aircraft include Rafale M, Super Étendard Modernisé, and E-2 Hawkeye. He has also released v4.1 of his TACAN Carrier Gauge package which adds animations and plane gaurd helicopters to the Charles de Gaulle. 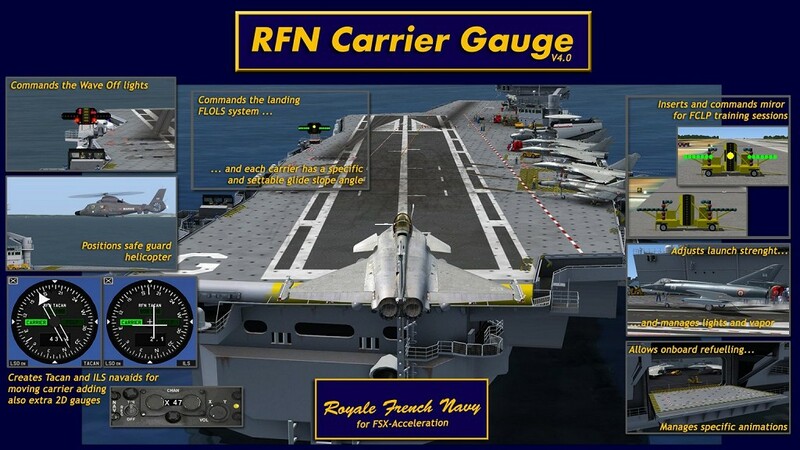 8 April 2013 - Sylvain Parouty is almost finished with v4.0 of his RFN Carrier Gauge and the new Charles de Gaulle (R-91) carrier. He sent this "advertisement" of the gauge which includes images of the carrier. More information and videos are available at the Royal French Navy website. 27 March 2013 - One of the earliest "friends" of this website was Thinus Pretorius of South Africa. After a lot of consideration Thinus has decided to retire from designing new aircraft, gauges, and instrument panels for Flight Simulator and dedicate his time to other endeavors including his ministry work. Over the years Thinus has given us many original models of the MD450 Ouragon, Mirage IIICZ, Mirage IIIEZ, Cheetah C, and Cheetah E.
21 March 2013 - The French scenery design group SkyDesigners have been busy releasing several new scenery packages that will be of interest to French military aviation and Mirage fans: BA 133 Nancy-Ochey (LFSO), BA 126 Solenzara (LFKS), BA 702 Avord (LFOA) and BAN Landivisiau (LFRJ). 12 March 2013 - Thinus Pretorius has completed a new Mirage IIICZ in SAAF colors for FS9 and FSX. This package includes one model with multiple weapon configurations, three texture sets, custom sounds, and a virtual cockpit and instrument panel with Mirage specific gauges. 4 March 2013 - A while back Michel Gérard sent me many photos taken while he was with the Armée de l'Air. I add them to the website from time to time. This latest set is from a trip to Istres AFB where pilots from Dijon-Longvic flew with the Mirage 4000. 25 February 2013 - The next batch of Mirage III/5/50 AI subjects from Michael Pearson are all based on the Mirage 5/50. The Atlas Cheetah series is coming. 16 February 2013 - Aaron Haase has painted another set of textures for the AI Mirage 2000C of Fernando Martinez. The textures represent an aircraft in special markings from the 2006 NATO Tiger Meet. Only the textures are included so you will also need the base Mirage 2000C aircraft. 28 January 2013 - A second AI Traffic package for the Argentinean Mirages and Daggers has been released. This package includes only the 15 currently operated aircraft (all in overall gray scheme) and scenery for Base Aerea Tandil (SAZT). 16 January 2013 - The first file of AI Traffic using the new Mirage III/5 AI aircraft of Michael Pearson has been released. It represents the Fuerza Aerea Argentina Mirage IIIEA, Mirage IIICJ, IAI Dagger, and Mirage 5PA aircraft all based at Base Aerea Tandil (SAZT). 12 January 2013 - Michael Pearson completed his AI fighter aircraft for the Fuerza Aerea Argentina with the release of the Mirage 5PA "Mara". He has also released trainer aircraft for Switzerland (Mirage IIIBS/DS), South Africa (Mirage IIIBZ/DZ/D2Z), and Abu Dhabi/UAE (Mirage 5DAD). 6 January 2013 - In addition to his work on the Mirage III/5 for use as AI traffic Michael Pearson has also been working on a Mirage IVA and IVP for use as AI traffic. Linked below is an image of the work in progress model. 3 January 2013 - Michael Pearson has released additional AI aircraft packages. One coveres the Mirage IIIBJ of the Israel Defence Forces from the early bare metal to the final camouflage schemes and with both the Atar-9B and Atar-9C engines. He has also issued packages for the IAI Nesher and Dagger. 1 January 2013 : Happy New Year!